The Church calls Christian parents to be the “first” teachers of the faith and the “best” teachers of the faith (The Rite of Infant Baptism). Godparents agree to assist in this ministry of parents. 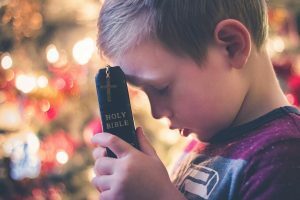 This resource from “Catholic Lane” is to assist you, parent or godparent, with using the Sunday Mass readings to teach about the Catholic Faith and live the Catholic Faith as a family. CATECHETICAL TALKING POINTS: These readings are an opportunity for parents and godparents to challenge the children in their call to discipleship and to help them realize the high demands of the call to holiness. There are various topics that can be chosen to be relearned by adults and discussed with the youth under their care. Faith is a response to God and includes obedient trust. This is uniquely modeled by Abraham and Mary (CCC 142-149). The Characteristics of Faith (CCC 153-165). Interior Conversion away from sin and reoriented toward Christ (CCC 1430-1433). Examples of Acts of Penance to develop conversion (CCC 1434-1439). Living in Christ (CCC 1691-1698). Pray for the child’s faith in Christ to grow and develop. Share a time when you were inspired to more firmly follow Jesus. Choose something to give up this week as a family: Television, Apps/Video Games, Texting, extra-curricular activities, etc. Be sure to fill that time with a moment of prayer or spiritual reading. Remove videos from your DVD collection that are contrary to the call to holiness. Examine your habits of prayer and reading Scripture on your own or with your child/godchild. Determine specific ways that it can be improved.